Just imagine a perfect summer holiday in the mountains of Austria – grass that tickles your toes, wind in your hair and the sounds of cowbells in your ears, dipping your hands in the cool, rushing water, drinking clear spring water. Milk, still warm, fresh from the cow, the crisp snap of fresh bread. The magnificent peaks of the Alps before your eyes. Experience all of this and so much more during your summer vacation in Gastein valley! Give yourself and your family the precious gift of an unforgettable time spent together. Hike along 350 kilometers of marked paths across broad alpine meadows in your summer holiday, or perhaps conquer our alpine summits accompanied by a Gastein mountain guide. Hohe Tauern National Park is a true treasure trove for anyone who loves the alpine world! And with your appetite awakened by the fresh mountain air, enjoy the homemade products that are served up at Gastein’s 55 mountain huts, staffed from June until late autumn. 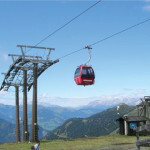 Families will love these child-friendly huts during their summer holday, which are also easy to get to with the help of Gastein’s mountain lifts, as they will the exciting experiences brought to them by the GASTI Club. By bicycle or mountain bike, you can set out on family-friendly cycle paths or tackle challenging MTB trails that will take you “up hill and down dale”! If golf is your passion, you can improve your handicap at numerous courses in the region. But perhaps you would prefer to try your hand at archery this once. Or, anyone for tennis? Whatever you decide, the main thing is that you have all kinds of fun during the most beautiful days of your entire year, your summer holiday here in Gastein!